Type "sudoku" into the search engine here at Nintendo Life and you'll discover two things. First, there are a lot of sudoku games out there, from children's starters starring Lola the Panda to those proclaiming to be for elite brains only. 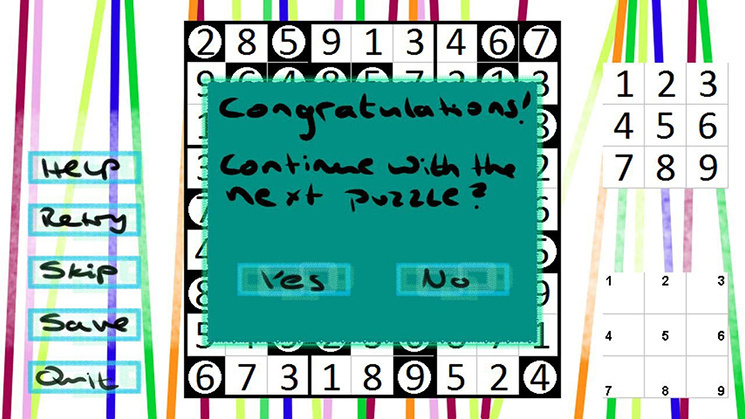 Second, of all these games, only this one here, Sudoku & Permudoku, is designed for the Wii U.
Sudoku & Permudoku offers two modes of play, with 500 pre-made puzzles for each spread evenly over five difficulty levels. 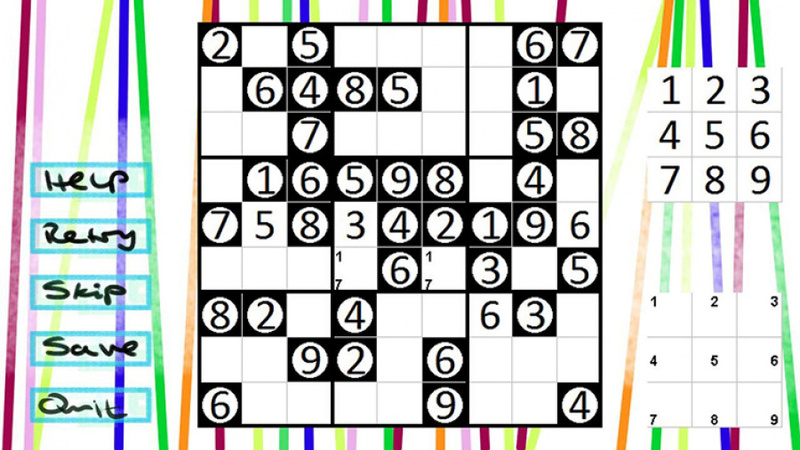 Sudoku likely needs no introduction; this is the classic puzzle of numerical Feng Shui, demanding a grid be arranged so all numbers appear only once per row, column, and 3x3 section. Permudoku takes the same rules and replaces the numbers with nine different colours, starting all the options already out on the board as tiles that can be swapped between. 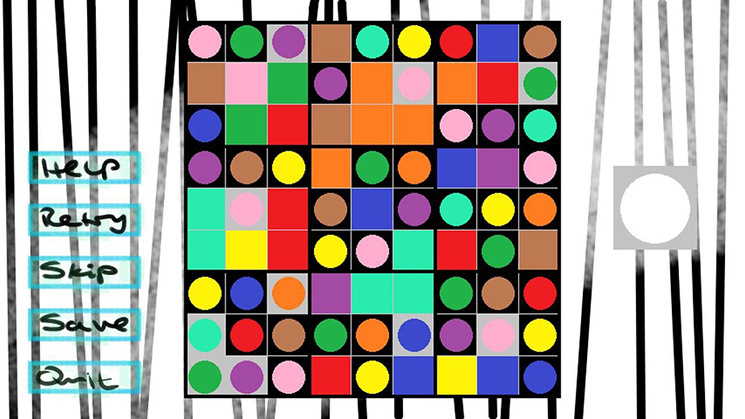 At first glance this game is not the prettiest puzzler in the land. Its aesthetic consists of coloured or monochromatic lines scattered about the background like a '60s nightmare bamboo forest. The puzzle selection screens are also rather bizarre things to try and understand for the first time, with more plus and minus buttons than one would assume to need. A little experimentation or a quick look in the manual, however, and these screens become a snap to operate. The ability to play on the go has been sacrificed, but in its place is the blessed commodity of space. The GamePad provides ample room to see the full grid clearly and at all times. 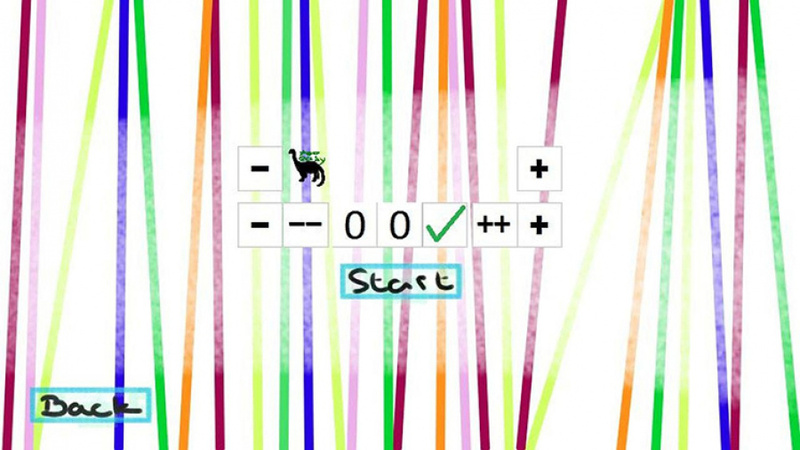 Every option you can enter into a square, from the full answer digits to temporary notes, is all laid out on the side of the board. Simply tap the target square, then what you want to put in it and you're good to go. No zooming and panning. No scrawling a number and waiting a half-second for the computer to recognize it. Filling in the grid is simple and satisfying, just like it should be. 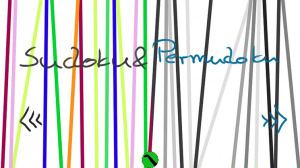 Permudoku also has a fundamentally simple touch-based control scheme, but is visually more mind-boggling.There are no sidebar selections, with players instead swapping between the coloured tiles that have already been laid out incorrectly on the grid. The pre-filled starter colours are all locked in and denoted as dots instead of squares, so there is no risk of mistaking them for movable parts. Even with that mercy, however, the sheer colour explosion can feel overwhelming at times. It can start to feel like it's all blending together, and the design of the grid itself can make it more difficult to visually lock onto and denote the important 3x3 squares within. It's a new way to look at sudoku, for sure, and some might enjoy the challenge. It could prove frustrating and just too much for others, however. The hint system in both game modes is generous and unlimited. Hitting the "Help" button at any time will either delete all the wrong entries on the Sudoku grid or confirm and lock in all the correct placements on the Permudoku board. The latter can be a great tool for those who get dazzled by all the colours, and the only penalty is earning a yellow checkmark for clearing the board instead of a green one. Check marks seem to be the only prize, and there are no additional challenges such as time trials to take on. A TV screen is not required for play, with all the action on the GamePad; the TV will only show basic instructions and really isn't worth turning on. The music comes entirely through the GamePad; a small pool of classical pieces including "Moonlight Sonata" and "Swan Lake (Op. 20)." It kind of feels like having a public radio station on, and quite fitting. Sudoku & Permudoku might not have the most appealing cosmetic style nor throw in any bells or whistles, but it makes nice use of the GamePad to provide a clean and intuitive puzzle-solving experience. 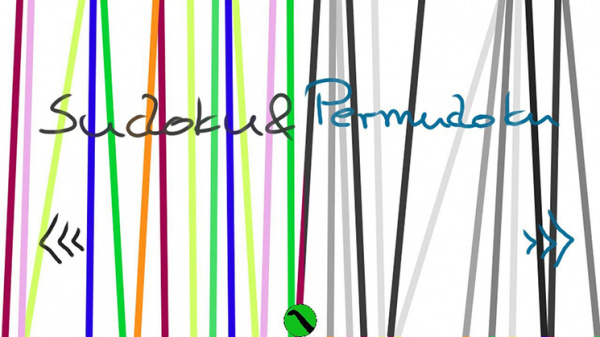 Permudoku, on the other side, is fresh, but might end up being a love-it-or-hate-it option for an audience that is well accustomed to the classic game. Even if that rarely gets touched, though, that still leaves 500 Sudoku puzzles for a pittance. Those who enjoy Sudoku at home or wherever their Wii U is plugged in should give this one a shot. You can play Sudoku for free on your phone. Maybe I'm blind but I don't see a price for this game anywhere on this page and I don't see it on the European Wii U eShop. Ah sure for $0.99 you could spend it on worse things. ..good review, a 6 sounds right..but that headline photo?..an 8?..there?..really?..lol..